The most important point is one from the questions – is higher cholesterol a cause or symptom of the injury of arteries? Cholesterol recruitment is part of normal wound healing. What if they have the arrow of causation backwards? What is missing is FFA – (might be good to keep this low). I don’t think we evolved LDL to cause heart disease. As is true of most proteins – they rarely have a single role. One role often overlooked is that lipoproteins are part of the immune system as well. Great to see yet another take down of the ungrounded narratives of diet. Yes – I often point to the reparative aspects of cholesterol, or more specifically, the LDL particle as a whole with endocytosis. But there’s likely a larger role with structural damage in the endothelium which brings about atherosclerosis. This is always treated as a bad thing in whatever form it comes, yet there’s still so little that has been observed with it’s beginnings and mitigation. Rather, the focus is only on its pathogenesis and advanced state of disease. The only way I know of to change the pattern of small dense vs light fluffy LDL to the better is to reduce carbohydrates – thus I’ve thought of the expensive tests as an over priced glucose test. I am thinking that the current assumption that LDL is causative of CAD if false. It could easily be a side effect of higher BG – a confounding variable. The narrative I think is most likely true is that the initial damage – the thickening of the inner intima is due to a growth factor – possibly insulin. It could be that cholesterol is recruited for the repair as it is in most wounds of our body. The one case of LDL – is in oxLDL – it is known to recruit monocots that evedentialy mistake the oxLDL for dead or dying bacteria – and thus engulf them – eventually forming foam cells. You can reduce oxLDL by eating less PUFA – (particularly Linoleic Acid ) – and by other dietary interventions. Even in this regard I think they may have it backwards. Free radicals / ROS are high severity bugs in the circulatory system. They are often described as “hijacking” LDL particles and turning them atherogenetic. But what if LDLp is actually the ones hijacking the free radicals? LDLp is already tasked with binding to pathogens to clear from the system, such as in an infection event. Why wouldn’t they likewise try to neutralize free radicals in the same manner, even if there’s a risk metric of location in or around the arterial wall? Do we have cops that run the bad guys off the road in a chase? Yes, though they try to do this only in situations where they feel the alternative is more dangerous. Like so many other systems in our body, why wouldn’t we assume this same cost/benefit decision lies with the lipid system as well? Not sure I follow your bit here – I think you are saying that LDL-p is acting an an anti-ox? Not so sure. The easiest way to lower oxLDL is to reduce PUFA consumption. PUFAs are all less stable – they want to oxidize and LA(Linoleic Acid) in particular forms nasty stuff called 4HNE that apparently causes T2D. My take is that ROS is a normal control signal in a cell – that mitochondria listen to. Most Anti-ox are marketing hype – ones that really worked well could have negative effects. We also know that PUFAs increase insulin sensitivity of adipose tissue. My take is seed oil is simply not human food – our ability to tolerate it likely varies with our genes. What if the real cause of the obesity pandemic is eating large amounts of seed oil? – I’m not saying LDLp is acting as an anti-ox (although they carry anti-ox, but that’s a bit of a tangent). Rather, that there’s a potential cost/benefit with their use as a backup with regard to containment of ROS in the absence of effective anti-ox defense. 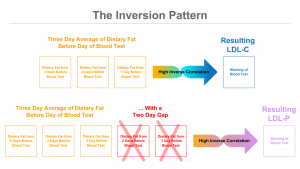 Wow – we are really on the same page — Do you ever read the hyperlipid blog? I have been on the ketogenic diet for 3 weeks now and have lost 10 pounds. I made this lifestyle change because I have been on medication for 1.5 years now to treat my type 2 diabetes and high cholesterol. Like everyone else, the last 3 weeks have been amazing and I have seen all the benefits being on keto. When I started keto 3 weeks ago, I immediately stopped taking all my medication for type 2 diabetes because I do measure my glucose many times throughout the day and if my sugar level spikes, I can go back to taking my type 2 diabetes medication. And instantaneously after going on keto, I saw my glucose level drop significantly in the range of 85 to 110 before and after meals. So keto has treated my need for the diabetes medication and rare insulin injections. As for cholesterol, since I cannot test my ldl levels at home, I did stay on the statin as well as another drug called losartan, which is a drug that helps reduce the blood vessels from narrowing. Since I have seen the positive impact of keto for my glucose levels, by my own decision beginning today, I will be going off my cholesterol medications (both the statin and losartan). I am seeing my endocrinologist in 3 weeks and hoping to see positive results for both my glucose and ldl/cholesterol levels. In the meantime, I want to test the Feldman Protocol under Option 2 conducting 3 blood tests on Day 1, Day 4 and Day 7. However, my question to you is how many days later should I begin the Feldman Protocol Option 2 since I want to make sure the statin and losartan are not affecting or skewing my test results on Day 1 through Day 7? Can I begin immediately or should I wait for a number of days in order for the statin and losartan to “flush out” of my body? I will certainly share my blood results when I receive them. And I do enter all the foods and drinks I eat and measured out using the MyFitnessPal app. First and foremost, I want to be sure you know I’m an engineer, not a medical professional and in no way does my protocol or any article on this site constitute medical advice. I try to avoid any individual recommendations, and this goes doubly so for anyone considering going on or off medication. As always, I’d recommend consulting your doctor, of course. With regard to going off or on a statin, I genuinely have no idea what the “wash out” period is. I want to guesstimate a week would be probably decent span. BUT, if I were considering testing the protocol after having been on a statin for a lengthy period of time, I’d want to add an additional test following the washout period and before starting the protocol. I’d want to know what my “normalized” cholesterol numbers are when not on the statin drugs and before modifying it with diet. Hi Dave, Firstly, great presentation, and thanks for taking the effort to get this out there. Just curious to get your thoughts on a few things..
– What are your thoughts on using a very very low dose statin? For example, i’ve tried using 5 mg crestor every other day and it keeps my LDLp in control! – In this video [https://youtu.be/K41m5_RXR-k?t=5m32s] Dr Bernstien mentioned that the radiation is not in-significant. Again, not clear if he’s talking about calcium score or coronary CT angiography. Are you aware of the radiation involved in Calcium Scores? I’m curious because getting a calcium score takes hardly 30 secs to a minute. Hi Dave, Just went through your comments on the other post. I think you have answered the statin questions there. Should’ve looked at them before asking, my bad! I do know that in my case (and where my numbers are) i don’t think i can take an LDLp of > 3500 lightly. If i do an LCHF, i probably will decide to be on a statin + zetia. I’m also in process of trying a plant based diet out. Transition from a LCHF to carb diet is not easy. Low blood sugar symtoms, feeling sleepy after meals, etc had become (bad) memories but they’re all back for now. Anyway, i’m curious to see my numbers on a more standard diet. Absolutely understandable! People often assume because I know so many issues with lipid hypothesis and the research behind it that I’ve concluded having high cholesterol is safe. No — there’s a difference between concluding something is wrong and pointing out the case for it is weak. Moreover, I should emphasize that “optimal” cholesterol may indeed be higher than current guidelines AND my (and your) cholesterol numbers by be higher than optimal as well (or even dangerous). The two aren’t mutually exclusive. As I always like to point out — I’ll go where the data takes me. There are two reasons why i’m trying the plant based low fat diet out. a.) the claim that intramyocellular lipids cause insulin resistance [https://nutritionfacts.org/video/what-causes-insulin-resistance/], b.) individual genetic variabilities and the possibility that plant based diet might be the most optimal for my set of genes. I will definitely report results if i can stick to this for a month :). I don’t know if this is the acclimatization phase but the change in well being has been dramatic (for the worse) for me at-least. From whatever i have learnt, I expect a low ldl, low hdl, elevated trigs and an increase in small dense particles. Again, we never know until we try it and see. I likewise expect lower LDL, lower HDL, and higher trigs. Not sure about the increase in small dense particles as I think this is very multifactorial. But even if so, I’m not sure what the real trade off is for atherogenic risk. – I’m probably more inclined to simply derive a greater amount of my energy from carbs over fat than to adopt a statin, *however* this isn’t a thoroughly researched area for me. Whenever I meet anyone who is both low carb and taking a statin, I inquire on how they are doing on it and if there are difficult side effects given the likely conflict between both deriving so much energy through LDLp on one hand while battling it via HMGCR with the statin on the other. Thus far, I haven’t really heard anyone suggest it has been challenging. So from an anecdotal standpoint, it might be fine. – The radiation exposure is something I actually care about a lot. Obviously it increases many unknowns with regard to ROS and damaged DNA. I’ve already had one CAC last year (and got a score of 0), and will likely have another in five years. A CT is considerably more radiation and is comparable to 200 chest X-rays. It is the equivalent of about seven years of the radiation a person would have through normal means of living (exposure to sun, travel, etc.). Yet a CT scan is the gold standard in visual data on the heart, and there’s one I’d like to get called a “640 slice” that’s the best of the best. But I’m currently leaning against it for now due to the radiation load. Not so sure we understand the radiation risk. At very low levels, it apparently reduces cancer. The question is if the rate of delivery of a diagnostic test is doing good or harm. The first clue was a guy looking at radon gas and breast cancer rate – the data said that people with a little radon got less cancer. The next was a building in Taiwan – the steel had been contaminated with colbolt-60 and once they discovered it they closed it and tore it down. Looking at the people that lived there – the longer they had – the less cancer they got.. Similar story with people out-side of Chernobyl. Anyway the effect is call <a href="https://en.wikipedia.org/wiki/Radiation_hormesis&quot; hormesis – controversial, but I think there is at least a bit of truth to it. There is controlled research going on that may give us a better answer. I definitely agree that we don’t fully understand the risks. Moreover, I suspect there are many more variables on an individual scale than are currently understood as well. – I recollect facing muscle aches with crestor 5mg (which is a very low dose anyway). However, i have heard that patients usually end up trying multiple statins before figuring out which one works for them the best. Apart from muscle aches i personally didn’t face any other side-effects for the short time i was on them. – Thanks for the info on radiation ^. I don’t think i’m going to have another CAC anytime soon. Hi Dave – At first, I didn’t think I’d learn much from your video, but damn was I wrong! The inversion patterns are crazy correlated. A question – in your talk, and on your site, I didn’t find a clear hypothesis for your enlightening experiments. The one that jumps to mind (but not sure if you would agree), is that if LDL and LDL-p counts change so dramatically with just a 3 or 5 day modification of diet (or more pointedly, the number of calories consumed HFLC), then how can cholesterol be used as a marker for CVD by public health if the levels can change so dramatically (though, it appears, to have an upper/lower limit to the change)? Or more personally, this data simply can get your doctor off your back. I was tempted to be a volunteer (and I still may – I’d go for the 10 day one), but I’ve been unemployed. When I get back on my fee, I’ll give it a shot (and thanks for that tip about requestatest.com – $99 for an NMR seems reasonable). Yes, there is a general theory… scroll ahead in the video to about 11:04 where I have the section, “The Theory Behind the Inversion”. 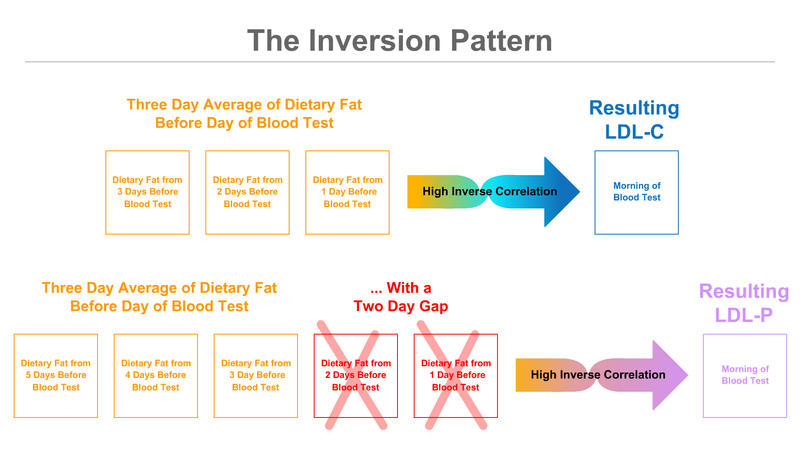 In short, the occam’s razor to me is that simply the body is up and down regulating LDL particles against what the incoming dietary fat is in a 3 day window. Chylomicrons (which come from food you just ate) are used up and cleared in a few hours max whereas VLDLs (from storage) can last several days. And since a cholesterol test is taken following a fasting period, only VLDLs are remaining and thus almost all cholesterol is picked up from that class of LDL particle. I have a story similar to Jill’s! My TC has been high (>230) ever since I started testing back in my 30’s (I just turned 57). My HDL has always been high as well though, typically over 80. I’ve been on keto for 2+ years and started for the same reason you did, pre-diabetes. I had my cholesterol checked a couple weeks ago and my doctor’s PA immediately yelled STATINS at me (non-fasting, TC 283, LDL 170, HDL 87, Tri 92, VLDL 18), which I refuse to do given the increased risk of statin-induced diabetes in post-menopausal women. I wouldn’t call myself a hyper responder since my lipid panels have been pretty constant through my adult life but like those that just want to get their doctors off their back, I will be using the Feldman protocol and having another test soon. I meticulously log my food (I’m a Cronometer fan) and will be able to provide that data as well. Cheers, and thank you so much for your work in this field! Yep — your numbers look so standard to me now. I’ve had so many people write in with this profile after going low carb and so many think they are an exception, that there’s something wrong with their numbers in particular. I’m 53 and I’m in ketogenic diet about 1.5 years. so, from my point of view. the change is minimal and the increase in TG was problematic. Obviously, the protocol isn’t mean to change your steady-state lipid levels (its tough to eat so much!). It’s really meant to show how dynamic they are, and in what direction they move in response to food. It can also be useful when dealing with someone who incorrectly believes they are static, who might say, give you a different insurance rate. I agree TG is a bit high. Has that changed compared to pre-keto? I know it’s not a way of life but I hope the change be greater. there is no doubt that the change is because of the diet. Your case is very fascinating! So you had higher TG before going LCHF, but the decrease wasn’t substantial afterward. Yet your HDL went way, way up relatively. Usually, if TG falls a lot, HDL rises a lot — and vice-versa, but that scenario is not a good one! This leads me to guess you’ve upped your foods rich in saturated fat. However, you may either more significant long-term insulin resistance you’re working on coming back from, or a genetic predisposition to hypertriglyceridemia. Do you know if your family has higher than usual TG overall?